Today, Microsoft has revealed at a press event in Tokyo that Kinect will be available for Xbox 360 in Japan November 20th of this year. Titles available at launch will include newly announced brain training game Lead: New Brain Training Where You Answer With Your Body, Kinect Sports, Dance Evolution, Crossboard 7 and SEGA’s first Kinect title, Sonic Free Riders. SEGA Japan has backed-up Sonic Free Riders November 20th release date in an update to the games official website this morning. 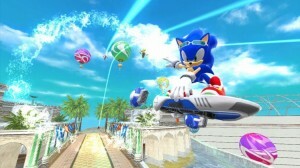 SONIC LOOKS DAMN AWESOME ON THE PICTURE ABOVE! Dang. What a mouthful. Lead: New Brain Training That You Answer With Your Body. Well, hopefully we’ll see some gameplay videos from people who purchase it, maybe we’ll get to see if it’s worth it. The xbox exists in japan!? Mind blown!! How about some trailers of the game, Sega? Then MAYBE I might consider getting this game if I can see more footage of this game (I’m still not buying an Kinect though. I’ll find some way to play it).